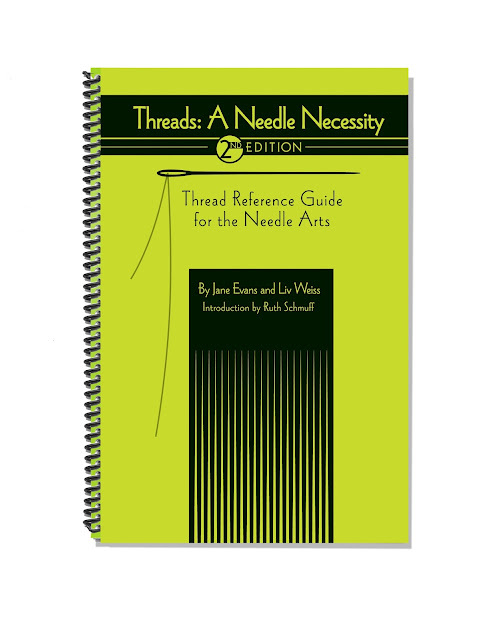 Can you believe it has been over 3 years since we introduced you to the fabulous Threads – A Needle Necessity book compiled by Jane Evans and Liv Weiss? This is the go to book written by stitchers, for stitchers, about threads. We are excited to announce that the book has been updated to include 50 more pages of new threads. The market is exploding with new threads, more colors, more sizes of threads! How can you keep up? Do you want to know how many colors it comes in? What is it made from? What can I substitute for it? How many plies should I use on 18ct, 13ct and beyond. And best of all, what else do I need to know about this thread, is it slippery? Should I bring my needle up in a clean hole or a dirty hole? So many tidbits all in an handy 5.5” x 8.5” format. And as if that isn’t enough there is a standalone, laminated quick reference guide that you can toss in your bag and carry with you whenever you head out to shop! Best of all a portion of the proceeds from every book sold will be donated to Canine Companions for Independence. You can read about this worthwhile charity here.